Style over substance: how an unlikely, unassuming liquid took over the planet. Patrick Leclezio looks over the world’s most internationally popular spirit. It can be made from everything, it doesn’t look like anything, and it tastes like nothing. These aren’t attributes that you’d think would best recommend a drink. At least not at first glance. Looking more closely though they neatly explain both vodka’s success and its dominance. Originating in Eastern Europe and Scandinavia, Europe’s “vodka belt” – Russia, the Ukraine, Poland, Sweden and Finland have a particularly strong tradition – vodka is now made just about everywhere, and significantly drunk pretty much anywhere. Its popularity is unmatched. It beggars the question – how did this come to be? Whisky is made from barley, bourbon is made from corn (primarily), rum from sugar cane derivatives (the molasses, the juice, the syrup), tequila from agave…I could go on. Most spirits are produced from a specific type of raw material, whatever was to be found in the area in which they originated, and to a large extent this has bound them to these regions. Vodka though differs in that it can be made from any vegetable matter. There is no legal restriction – although the “vodka war” of the early 2000’s pitted historic against new producers for this very reason, with the former seeking to restrict materials to the traditional: cereal grains, potatoes and sugar beets. The dispute was settled with a compromise that compelled vodkas made from other ingredients to declare it on the label, in Europe at least. 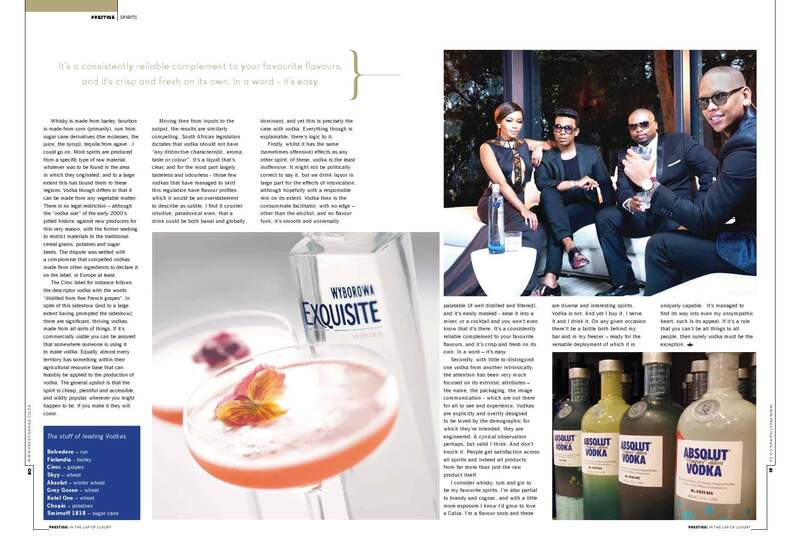 The Cîroc label for instance follows the descriptor vodka with the words “distilled from fine French grapes”. In spite of this sideshow (and to a large extent having prompted the sideshow), there are significant, thriving vodkas made from all sorts of things. If it’s commercially viable you can be assured that somewhere someone is using it to make vodka. Equally, almost every territory has something within their agricultural resource base that can feasibly be applied to the production of vodka. The general upshot is that the spirit is cheap, plentiful and accessible, and wildly popular, wherever you might happen to be. If you make it they will come. Firstly, whilst it has the same (sometimes offensive) effects as any other spirit, of these vodka is the least inoffensive. It’s might not be politically correct to say it, but we drink liquor in large part for the effects of intoxication, although hopefully with a responsible rein on its extent. Vodka then is the consummate facilitator; with no edge – other than the alcohol, and no flavour funk, it’s smooth and universally palatable (if well distilled and filtered), and it’s easily masked – ease it into a mixer, or a cocktail and you won’t even know that it’s there. It’s a consistently reliable complement to your favourite flavours, and it’s crisp and fresh on its own. In a word – it’s easy. Secondly, they say clothes maketh the man – I’m not sure I agree but clothes certainly maketh the vodka. It’s the ultimate branded spirit. 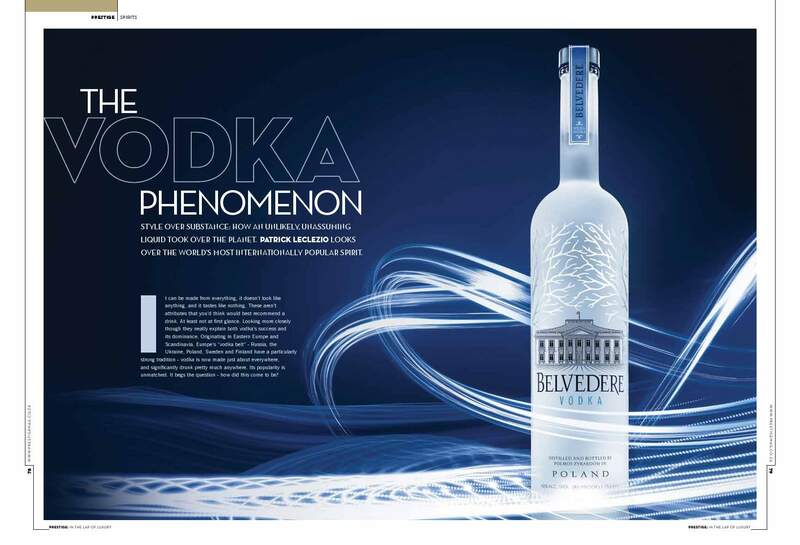 With little to distinguish one vodka from another intrinsically, the attention has been very much focused on its extrinsic attributes – the name, the packaging, the image communication – which are out there for all to see and experience. Vodkas are explicitly and overtly designed to be loved by the demographic for which they’re intended, they are engineered. A cynical observation perhaps, but valid I think. And don’t knock it. People get satisfaction across all spirits and indeed all products from far more than just the raw product itself. I consider whisky, rum and gin to be my favourite spirits. I’m also partial to brandy and cognac, and with a little more exposure I know I’d grow to love a Calva. I’m a flavour snob and these are diverse and interesting spirits. Vodka is not. And yet I buy it, I serve it and I drink it. On any given occasion there’ll be a bottle both behind my bar and in my freezer – ready for the versatile deployment of which it is uniquely capabable. It’s managed to find its way into even my unsympathic heart, such is its appeal. If it’s a rule that you can’t be all things to all people, then surely vodka must be the exception. This entry was posted in Spirits column and tagged Vodka. Bookmark the permalink.